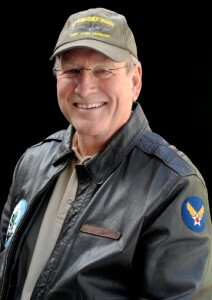 Steve Snyder is the author of the book Shot Down: The True Story of Pilot Howard Snyder and the Crew of the B-17 Susan Ruth. It tells the story of his father's experiences in World War II. He worked in national sales and sales management before retiring, and he lives in Seal Beach, California, and Sedona, Arizona. Q: Why did you decide to write this book about the experiences of your father and his crew during World War II? A: I retired in 2009 from a 40-year career in sales. I had no writing background. I was always interested in World War II and my dad’s experiences. I had the time to delve into it. I knew my mother had kept all the letters he had written. I read them, and I was blown away. He was just so candid. A lot of people, their relatives didn’t say too much, but he talked about bombing missions, what life was like, social situations. I just became more fascinated with the story of him and his crew. I had no intention of writing a book, I just wanted to put it all together. I started reading books about the air war over Europe, I downloaded military documents, I searched for members of the crew to see if they had letters or pictures. Most relatives knew relatively little about their veterans’ World War II experiences; most of them didn’t talk too much about it. I started going to reunions. I came to the conclusion that the story of my dad and his crew was so unique, I decided to write a book. That was in 2012, at a reunion in Savannah. It took 12 months to write the manuscript and eight months to publish it. The backbone of the book is the letters, in chronological order, following his missions and giving information on his pilot training. Originally I thought it would be the story of my dad, but I learned it was about the crew and all the men who served. Q: You’ve described your research--what did you learn that particularly surprised you? A: I learned a lot of things along the way. Having access to bomb squadron diaries—it was all fascinating stuff. It’s amazing how much information is available. I never could have done it without the internet. It was fun whenever I connected with relatives of the crew. We had a common bond. One thing that was surprising was I got a message on Facebook from a 20-something girl asking if I was related to Captain Howard Snyder. [She said,] My great-grandmother hid your dad during the war. I knew nothing about her. She and her father provided me with information in the book when my dad was hidden by her great grandmother. Getting information I hadn’t known about was so exciting. The biggest surprise was finding the German Luftwaffe pilot who shot down my dad. I owe it to my wife. It never dawned on me. I thought he’d be dead. One day, she casually said, Why not try to find the pilot. I thought it was ridiculous, but why not give it a shot. I joined German Luftwaffe forums and within a week, two guys got back to me and said [the pilot] was Hans Berger…He was a translator after the war so he spoke English… He was a little leery at first, but over time I built up his trust and we developed a friendship. It was wonderful to go to Munich a year ago and meet him. I hope to do a documentary. I just sent Hans an email this past week. Q: Did writing this book change your perceptions of your father and his wartime service? How much had you known about his experiences? A: I knew some of his experiences before I started writing the book, but I learned more. I got more of an appreciation of what he did. When you’re little, you’re not talking about what your parents do, and when you’re older, you’re thinking about your career, your kids. Now we’re empty nesters and I had the time to appreciate it. It’s amazing what he did. 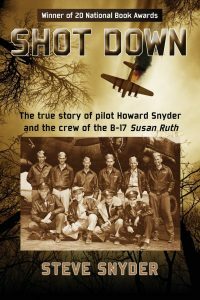 Being shot down—the shock of bailing out of a burning plane, coming down in a foreign country, with no idea of where you are, what’s happened to your buddies. You must be scared. The people who are supposed to be helping could be collaborators. When you’re being hidden, in a few instances he was almost discovered. The Gestapo could break into a house at any time. He had the courage to decide to join the French Resistance. His helpers said it was way too dangerous, but he insisted. He had infantry training before he went into the Air Force, and he knew how to fight on the ground, but if he had been captured by the Germans, he would have been shot on the spot. The courage he had was amazing. Could I ever do that? My dad was a great guy. I always compare him to John Wayne, or James Arness from Gunsmoke. He was a big guy, a rugged guy; like [many in] that generation [he focused on] God and country and duty and family. A: Most people don’t know that much about World War II, and don’t have an appreciation for what these guys went through. Most were really boys, not men. The United States was a really rural country. Most people lived on farms, and a lot of the guys had never been out of their home towns. They were really provincial, and all of a sudden they were on bases, training, and then they were halfway around the world. They answered the call: We’ll do it. The courage, bravery, and commitment they had—people need to learn about that, and never forget the sacrifice they made for their country and for future generations. People don’t realize that the first couple of years of the war, it was in doubt who was going to win. It wasn’t until 1943 that it looked like we had the opportunity to defeat the Axis powers. The country was on edge and scared…Most people living at that time who realized sacrifices are in their 90s today. It’s a small percentage of the population. A: I work full time still promoting my book. Every day I’m on the computer doing social media, contacting people who might be interested. I attend air shows around the country, I make Power Point presentations. I’m trying to spread the word and educate people. Also, I’m the president of the 306th Bomb Group Historical Association [which tries to] remember what happened, honor the men, educate the public. It’s a passion. I love doing it. I’m in my third year now. It’s still very enjoyable. [About] the documentary—we have over 16 hours of raw footage. I’ve contracted with a guy to do editing and put it together, and make it into a 45-minute documentary. Depending on the finished product, I’ll promote that…A lot of people say it should be made into a movie, but that’s a long shot. Hopefully I’ll submit the documentary to film festivals. A: When I was writing the book, I didn’t want it to be another war book for guys. Hopefully I would write it in a way that would appeal to the general public who weren’t history buffs. It’s a good story about people and the American spirit. I’m really happy when women read the book or people who aren’t history buffs. The highest praise from anyone is from the Eighth Air Force. If they think it’s a good book, it’s a good book. My favorite people buying the book are Eighth Air Force vets and young kids, 7 to 12 years old, who are interested in World War II. That’s very gratifying.